This fresh take on enchiladas pairs some of my favorite flavors for a hearty, but also healthy, festive dish! It’s super easy (I often buy a rotisserie chicken for added convenience) and absolutely delicious! This recipe makes about four enchiladas; double the recipe for a larger crowd! These photos were taken by the incredibly talented Cacey McReavy. She is the owner of Plumeria Photography, based in Denver, CO. She works with restaurants and individuals and you can contact her here. 2. Drizzle extra virgin olive oil in a small sautéing pan and cook the chopped onion for 3-4 minutes until fragrant and translucent. Remove from heat. 3. Pour half of the salsa verde into the bottom of an 8x8 or 9x9 baking dish and set aside. 4. In a medium bowl, combine the cooked sweet potatoes, diced or shredded chicken, black beans, corn, cooked red onion, garlic powder, chili powder, cumin, cilantro, salt, and pepper. Mix everything together. 5. 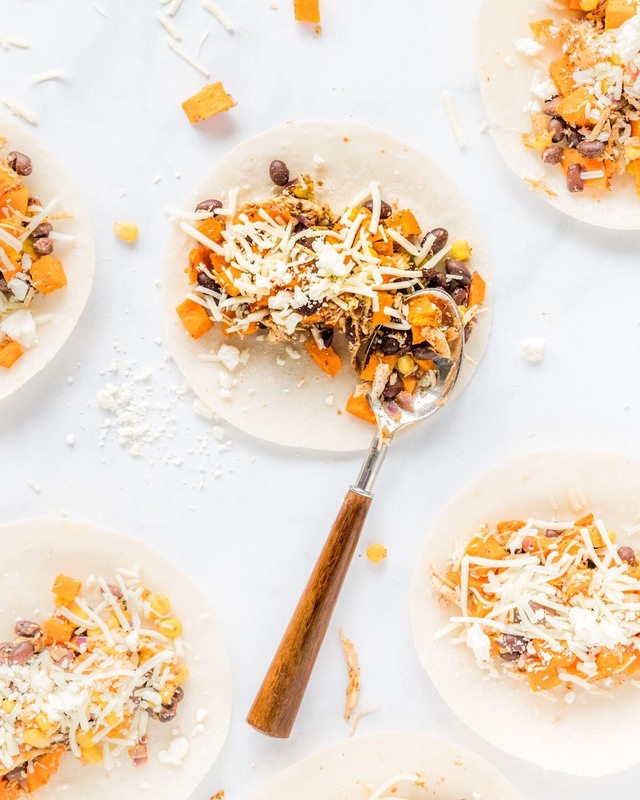 Lay warmed tortillas on a flat surface and spoon a quarter of the sweet potato mixture onto the center of the tortilla. Top with 1/8 cup Monterey jack cheese and 1/8 cup crumbled feta cheese. Roll the tortilla and place seam side down into the prepared baking dish. Do this with the remaining three tortillas. 6. Pour the remaining salsa verde over the enchiladas and top with remaining ¾ cup cheese. Bake for 20-25 minutes, until cheese is golden brown and enchiladas are bubbling. 7. Garnish with chopped avocado, cherry tomatoes, olives, additional cilantro, and sour cream. Enjoy!